[ Lord Garvagh, Irish politician. ] Autograph Signature ('Garvagh') on part of Autograph Letter to 'Mr Lackington', i.e. the London bookseller George Lackington (or James? ), with reference to 'Pictures' being 'turned out of doors'. 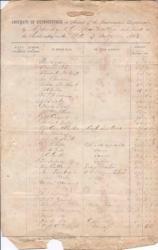 [First World War Royal Navy Night Order Book.] Autograph Signed night order book of Lieut. Commander E. T. R. Chambers, relating to the destroyers HMS Kennet, HMS Welland and HMS Otter, and mostly spent around China. In 'S.553' Night Order Book ('Revised December, 1910') by Waterlow & Sons Limited, Printers, London Wall, London. 25 October 1911 to 4 March 1915. 82pp., small 4to. In good condition, on lightly aged paper, in worn black cloth, with large printed official 'NIGHT ORDER BOOK' label on front cover, to which Chambers has added 'Captain's' in large letters, and 'TO BE RETURNED TO MY CABIN'. Ruled pages, with printed 'NIGHT ORDER BOOK, H.M.S. [name of ship in manuscript] | ORDERS.' at head. On letterhead of the Vice Regal Lodge, Dublin. 6 June 1918. 15 items relating to Lieut. 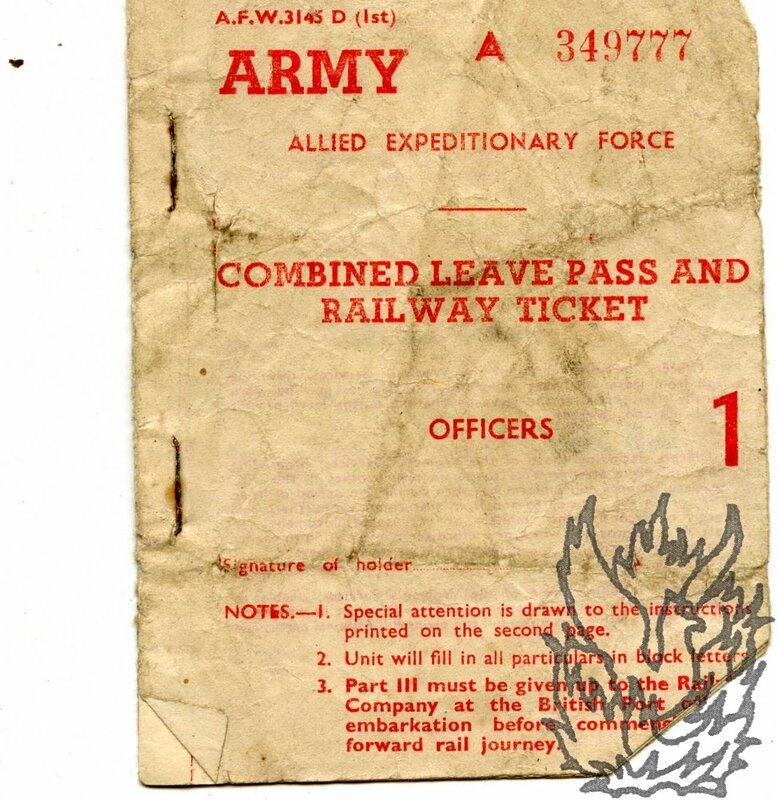 A.H. Ross's service in the Second World War as Platoon Commander in the Hertfordshire Battalion of the Home Guard, including Platoon photographs, Special Army Orders, service certificate, letter from Lt-Col. H. K. O'Kelly. 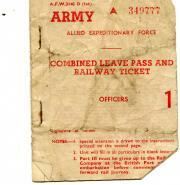 Items from the War Office, London, and Hertfordshire. From 1940 to 1944. The fifteen items in fair condition, lightly aged and worn, laid down or pinned to leaves removed from an album. Items One to Three: three black and white landscape photographs, each around 15 x 20 cm. The first photograph, captioned 'November 1940', shows Ross standing in a field, in front of a platoon in two columns, shouldering rifles with bayonets. The second photograph, captioned '7. C. Coy of Batt., Herts Home Guard 1943', shows twenty-six officers, in three rows, in front of the entrance to a municipal building. The front row, seated, consists of seven senior officers with batons. Autograph Signature ('J. C. Sherbrooke.') of Sir John Coape Sherbrooke, 'Commander of the Forces', Governor of Nova Scotia and Governor General of British North America. On piece of 6 x 8.5 cm. laid paper, cut from a document, with discoloration and traces of glue from previous mounting. Sherbrooke's signature is large and firm, with the words 'Commander of the Forces' in another, contemporary hand, beneath it. A scarce signature. Four Autograph Letters Signed (all 'JPVH'), from Lieutenant-Colonel John Plunkett Verney Hawksley, DSO, RFA, to his mother in England, describing in detail his life in Kashmir, and including comments on bear hunting and the cost of living. The four letters addressed from: dak bungalows at Rawal Pindi and Magam, near Srinagar, Kashmir; Rowbury's Hotel, Murree; from Srinagar iteslf; and in camp, near Islamabad, Kashmir. One undated, but all four written between 7 July and 11 August 1899. The four letters totalling 16pp., 12mo. Each on a bifolium. All four good, on lightly-aged paper. Chatty and informative letters, in the bored tone of the English upper classes, and exhibiting a shocking casual racism. One: From Dâk Bungalow, Rawal Pindi, 20 July 1899, and Rowberry's [sic] Hotel, Murree, 23 July 1899. 4pp., 12mo. He apologises for a hurried letter of the previous day. 'I began my journey very badly by calling a high caste mahomedan who was snoring in my carriage a Scor - (pig) he got very irate. Autograph Signature ('Wellesley') of Richard Wellesley, Marquess Wellesley, Lord Lieutenant of Ireland, on printed warrant appointing Walter Redmond of Ballycotton [Baile Choitín], County Cork, a Customs and Excise 'Preventive Officer (Water Guard)'. 'Given at His Majesty's Castle of Dublin, the eleventh Day of July 1822'. On one side of piece of 27 x 38 cm paper. Aged and heavily-creased, with central closed tear. A printed document, with engraved portrait of King George IV in the top left-hand corner, completed in manuscript and signed by Wellesley and three others, with fading to the manuscript parts. The document is headed: 'To all People to whom these Presents shall come Greeting. 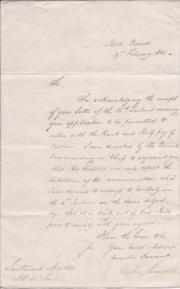 Typed Letter Signed from Cahir Healy to Lieutenant C. H. Glendinning, discussing George Lansbury's support in the House of Commons for his case of wrongful imprisonment, and hinting at a cover up. 1p., 4to. Eighteen lines. On creased and lightly-aged paper. On 21 February 1924, in the House of Commons, Lansbury 'asked the Secretary of State for War if his attention has been called to the fact that the Officers' Association have sent in a claim to the Army Council for compensation on behalf of Lieutenant C. H. Glendinning, 3rd Battalion Royal Irish Rifles, on the grounds of the false imprisonment, conspiracy and persecution to which this officer was subjected whilst serving in India during 1917'. Landscape 12mo, 16 pp. Stapled. Printed on art paper. Text and all images clear and complete. Worn and aged, with closed tear to last leaf repaired with tape. Diaries of Lieutenant Albert Smith, RN, 1867-1897 and 1914 to 1919, describing tours of East Africa and the Mediterranean, and giving a first-hand account of the sinking of HMS Victoria following its collision with HMS Camperdown, 1893. 1867-1919. From various locations in England, Europe, Africa and the Middle East. Ten notebooks, nine of them 4to and the other folio, totalling in excess of a thousand pages. Not uniform. In original worn bindings, five with marbled boards and the others in full cloth. Internally all ten volumes are sound, with their texts neatly-written, clear and complete. Numbered 2 to 18 (lacking 1, 7, and 12 to 17). The dating of the diaries is as follows. ONE ('2'): 15 May 1867 to 1 September 1868. TWO ('3'): 4 September 1868 to 19 September 1870. THREE ('4'): 20 September 1870 to 7 September 1872. 'A diary written by "Albert Smith" G.M. & G.S. 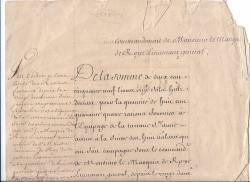 Two manuscript receipts from 1707, in French, for sums of money for the payment to Louis de La Rochefoucauld, Marquis de Roye, Lieutenant-General of the Galleys, of money for rations for the 'Tartane armée', authorised and countersigned. Folio, 4 pp. Both on the same bifolium. All texts clear. 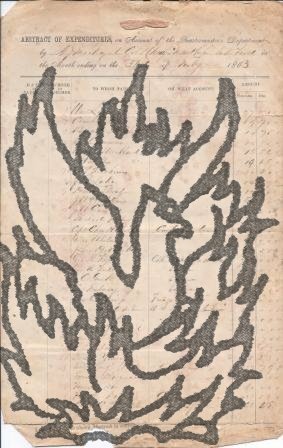 On aged and worn paper, with chipping and fraying to extremities. 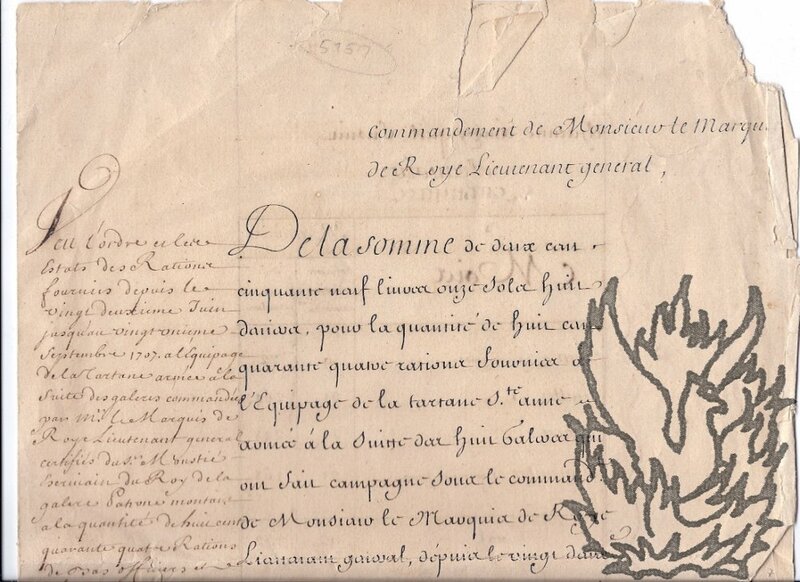 Presumably part of a series of ongoing receipts, as the the first begins in the middle of the preamble '<...> commandement de Monsieur le Marquis de Roye Lieutenant general, | De la somme de deux cent cinquante neuf livres onze sols huit deniers [...]'. 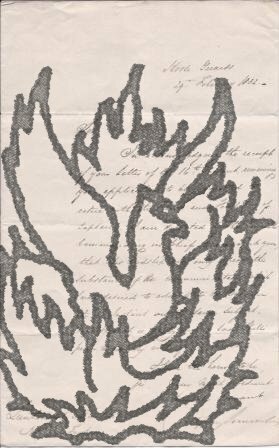 The receipts are neatly written out, with two long authorisations in the margins, each bearing the same illegible signature. Twenty-six items of ephemera relating to the 1st Battalion The Rifle Brigade, and Peter Kirwan-Taylor, designer of the Lotus Elite car, and assembled during his service in the Brigade as a Lieutenant. Texts of all items clear and complete. The collection on aged paper, with occasional wear and creasing. 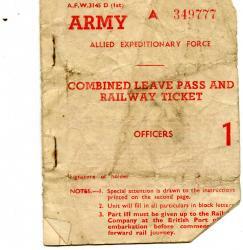 Includes Kirwan-Taylor's 'Range Barrier Pass Certificate', his 'Combined Leave Pass and Railway Ticket'; an 'Application for a Game Licence in the British Zone of Germany' by him; his 'Final Clearance Certificate. Autograph Card Signed ('W. 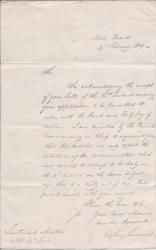 S. Crockett') to Lieut. J. W. Light of the 25th Reserve Battalion, Bramshott Camp, Hampshire. 30 October 1917; The Manse, Tweedsmuir, Scotland.